Before the Chiplet, we definitely started doing brunch more often. K runs everyday, and he doesn’t eat before his workout so is ready for a nice breakfast in the late morning. The Fudgelet and I will eat breakfast before my workout (where he often joins me) and then are ready for lunch in the late morning. Since our breakfasts are usually simple, we are fine with anything for lunch from burgers to scrambled eggs. Today is a special day for K and me: 3 years of being married! It’s also our last wedding anniversary without a baby. Dun dun dun… In honor of the special occasion, I am sharing a recipe I would never have bothered with if I wasn’t married to K. He loves fruit treats. 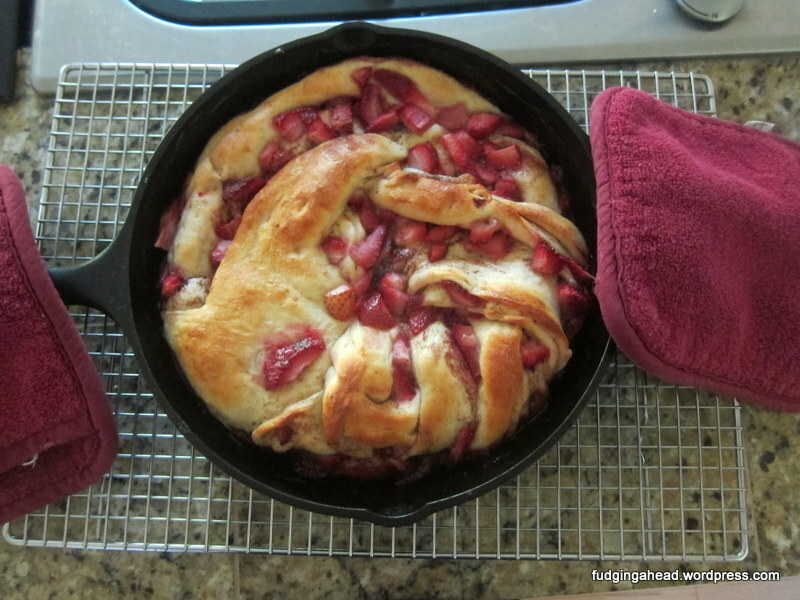 He said this treat should be called strawberry bread pudding because it does get nice and soft, but still remains bread-like. It didn’t last very long because it can work as an afternoon snack or for breakfast. 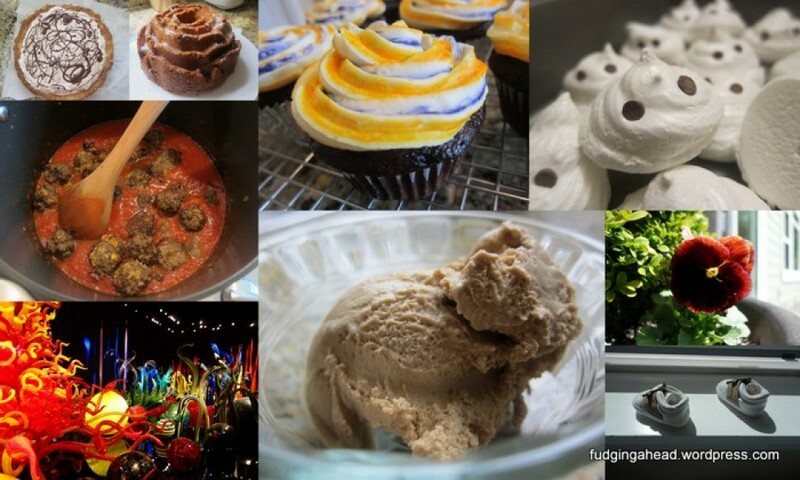 This post was all about using random food items I had accumulated through the week. This included half of a stale baguette, half of a doubled Walnut streusel recipe, some heavy cream, and some egg whites. 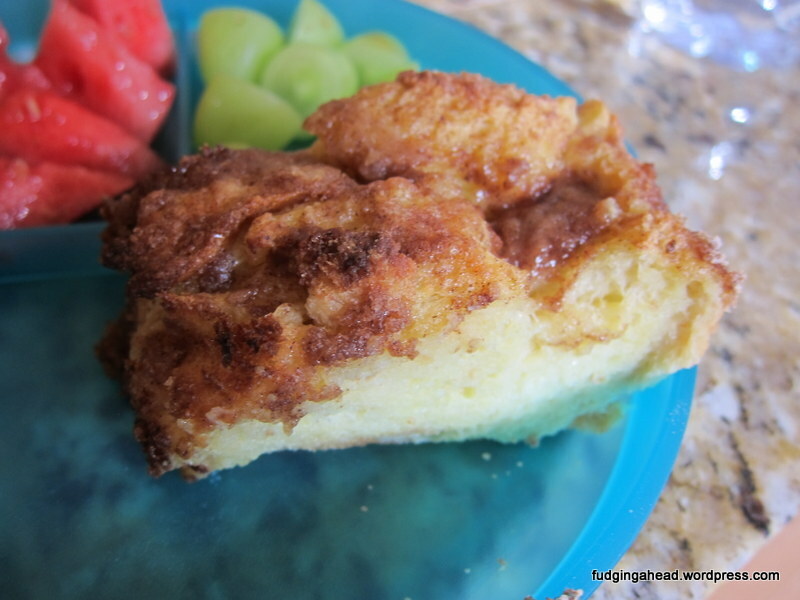 It all worked together very well with this bread pudding. Feel free to make some additions or subtractions when you make it. With so much gloomy wet weather here lately, I have been motivated to make lots of comfort food. 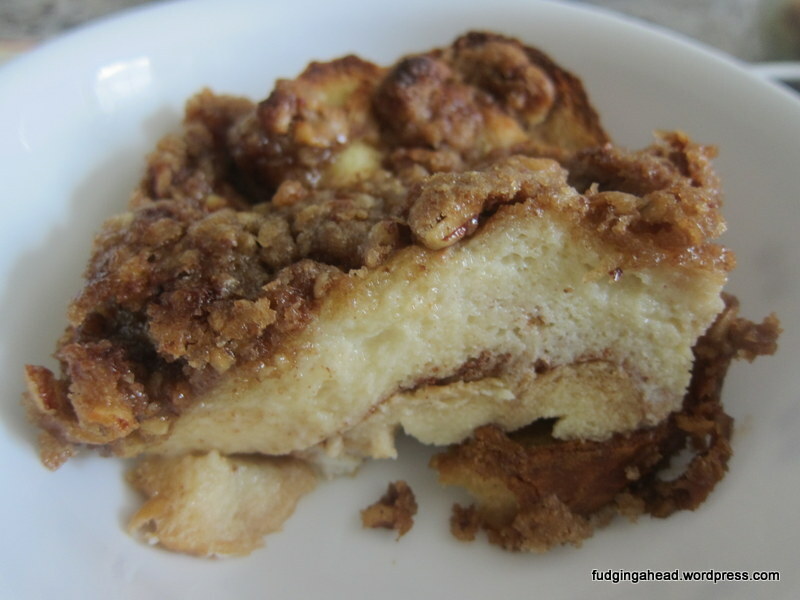 When I first made bread pudding, I was looking for inspiration but many recipes required overnight preparation. Since I had not planned ahead for it, I decided to wing it and liked my results. In fact, K actually prefers that one slightly to this one. This recipe is a bit more filling, and he thought it felt “less healthy” even though it is only the topping that really puts this one over the edge. I basically followed America’s Test Kitchen recipe, but they call it “Make-Ahead French Toast Casserole with Caramel-Pecan Topping”. To me, it tastes like bread pudding with pecans, so that is what I am calling it for my records. I made a few changes because we are a cinnamon-loving household here. We also never have a whole loaf of Italian/French bread just hanging around. I mean, who does? If you buy bread, don’t you start eating hunks of it that day, then put it to the side with grand plans you forget about? This happens often here. We can get through a solid half loaf, but it is really hard to finish a whole loaf before it starts to go stale. So, I decided to let this half go stale and make an overnight bread pudding. To my surprise, they expected me to use a whole loaf. Well, this is the halved version made slightly healthier than their version. Another day in October, another apple post for fall? I know this is not a Halloween post, but I cannot say that I have ever made a Halloween recipe before. I am not very crafty or creative with decorating, but I also am waiting for a reason to do it. My husband is not going to be as impressed with ghost cookies or the like. But, as I said in my last post, we have a bunch of apples in the house. This means I need to find different ways of using them to take advantage. 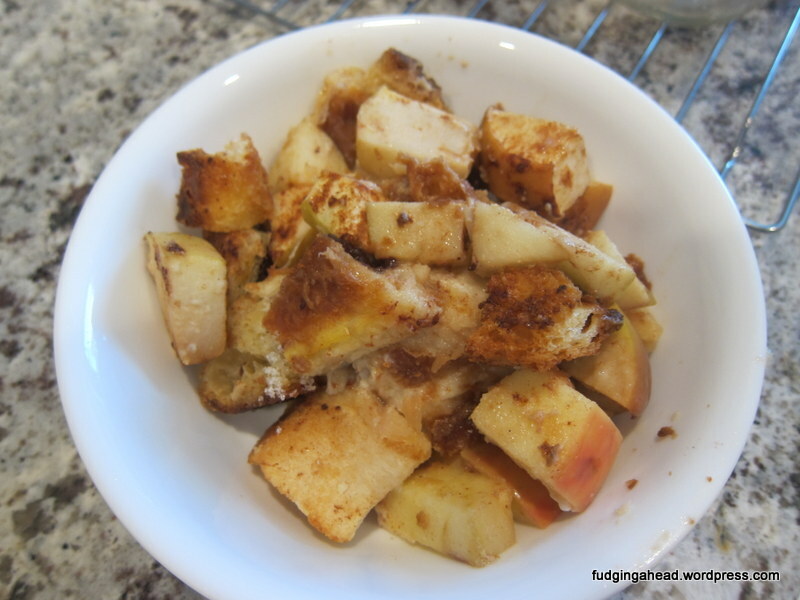 If you liked the sound of the apple crumb, then you will probably enjoy this breakfast version. To be honest, I was making this recipe because I had stale croissants and a pain au chocolat that needed to be used in some way. Bread pudding seemed like a great way because I remembered reading somewhere that old croissants were a nice decadent addition to bread pudding. Well, I could not find a recipe with it so I decided to make my own. This one is not as pudding-like as some recipes, but it worked for me. You could use other fruit, and you do not need croissants but they were really nice in this. I was pleasantly surprised how nicely the bits of chocolate from the pain au chocolat paired with the apple. If your bread is not stale, no worries. My croissants were not enough, so I used some Italian bread that was bought fresh the day before. I was already preheating the oven, so while the oven preheated, I placed a pan with the bread cubes in the oven. By the time the oven was preheated and I had prepared the apples, they were ready. 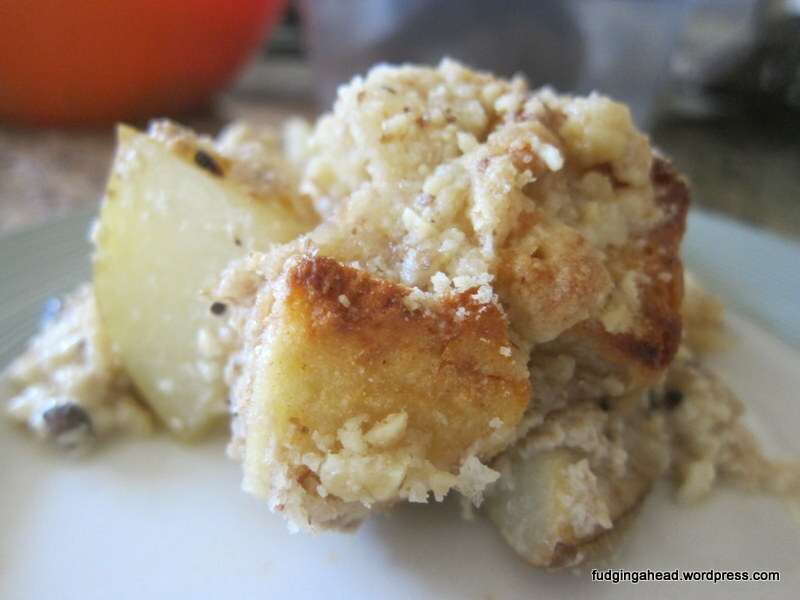 You could toast them longer if you prefer a crunchier bread pudding. I liked having a combination of half stale and half toasted.